The Powerheart AED G5 Trainer simulates different heart arrhythmias and gives students the opportunity to apply defibrillation pads, practice AED use, and perform CPR compressions on a manikin. The clear, instructive voice and metronome guide the user through the rescue scenario. Reusable training pads enable instructors to provide training for adult and pediatric rescues. Select among three pre-programmed rescue scenarios. Simulate shockable and non-shockable rescue situations. Use the CPR Device to assess performance to 2010 Resuscitation Guidelines. Train users to perform CPR compressions using a metronome. Use a wireless remote control to vary the rescue conditions while students respond. Pause the Trainer in mid-scenario to emphasize an important point, and then continue at the same point in the simulation. Demonstrate automatic and semi-automatic AED operation. The AED Training Device is a simulated AED designed for teaching basic rescue skills and correct defibrillation procedure to first responders who use Cardiac Science AEDs. 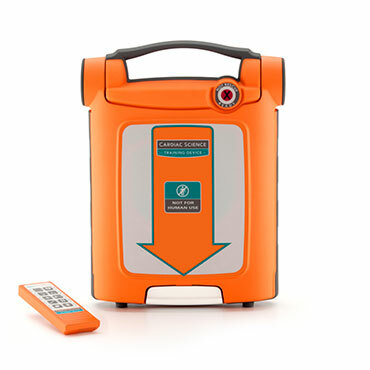 The AED Training Device can simulate each rescue stage, create simulated cardiac rescue scenarios (both shockable and non-shockable) and allow instructors to operate the AED Training Device by remote control. See a product or class you’re interested in? Contact us for more information.